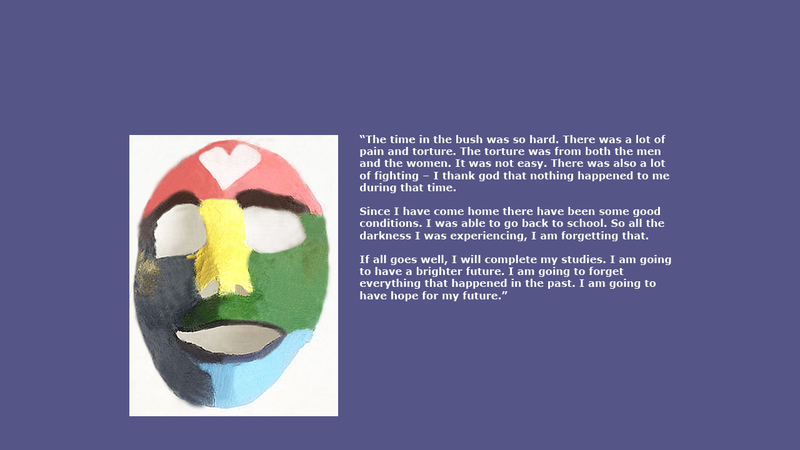 This gallery contains artwork and stories by children who were abducted and forced to serve with the Lord’s Resistance Army (LRA) in Northern Uganda. 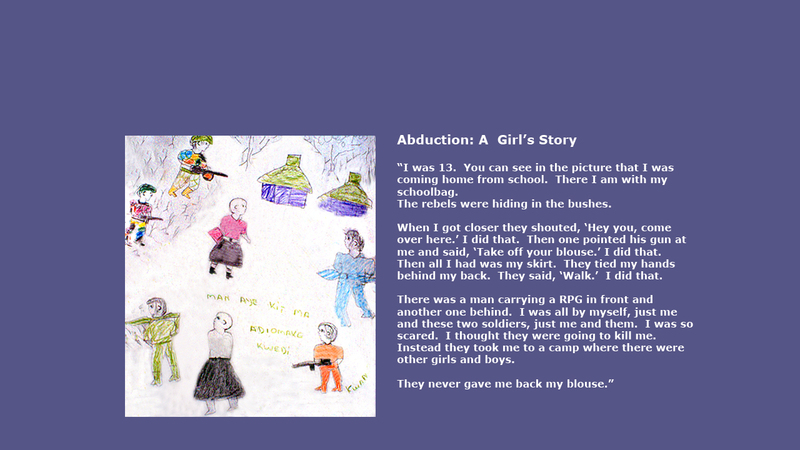 This gallery contains drawings, paintings and writing by children who were abducted by the Lord’s Resistance Army (LRA) from the 1990s – 2004. 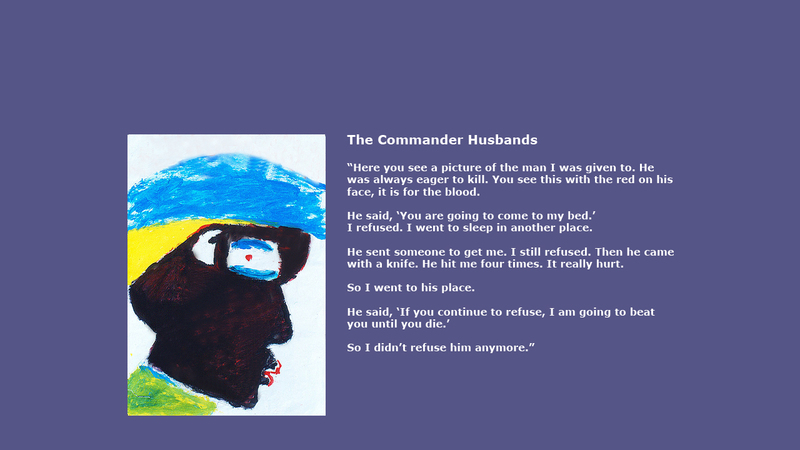 As many as 40,000 boys and girls were forced to serve with this brutal armed group in its struggle to overthrow the government of Uganda. 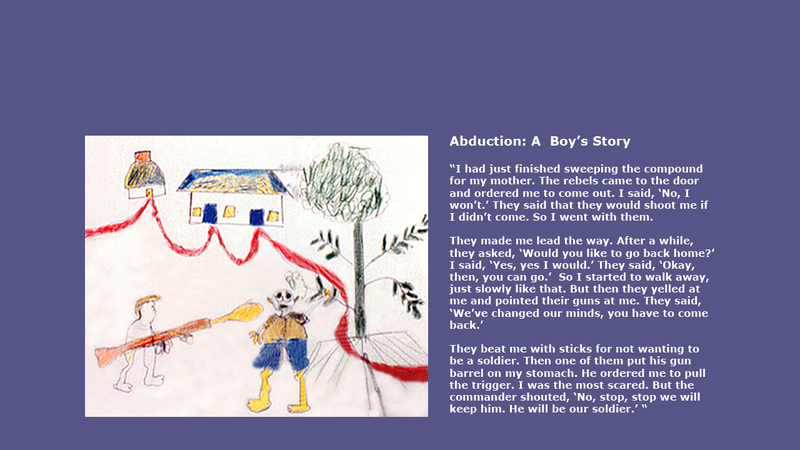 Once taken by the LRA, these boys and girls essentially vanished. There was no news about their condition or whereabouts. Parents lived in despair and hope, hoping that their child would escape or be rescued. 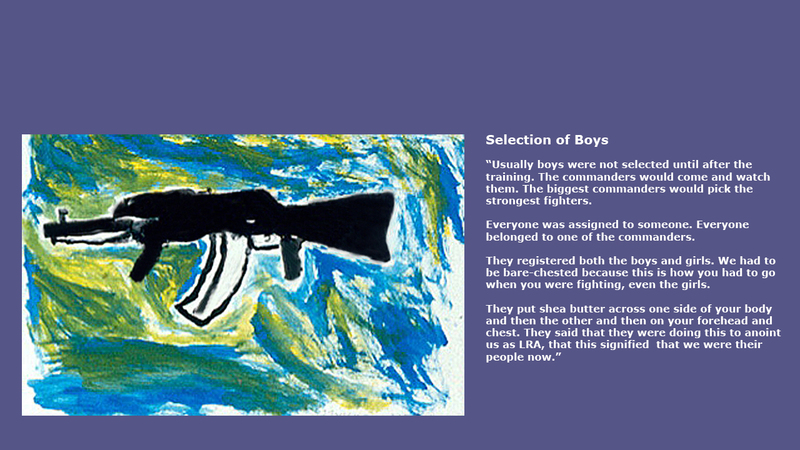 Life inside the LRA was harsh. Many thousands of young people died because of starvation, thirst or injuries. 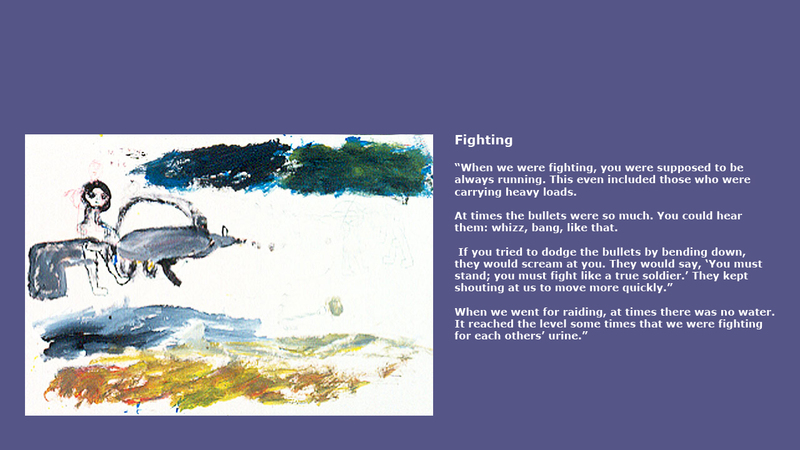 Those who were able to stay alive were forced to take part in fighting, raids and looting. 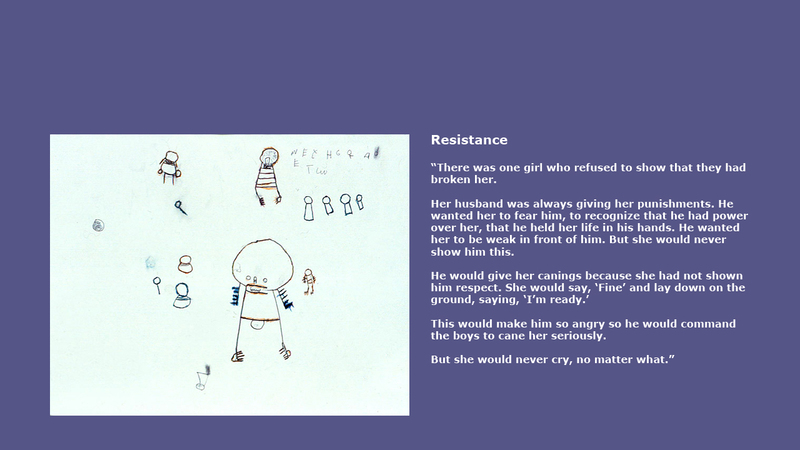 Anyone showing the slightest sign of resistance was severely punished or killed. 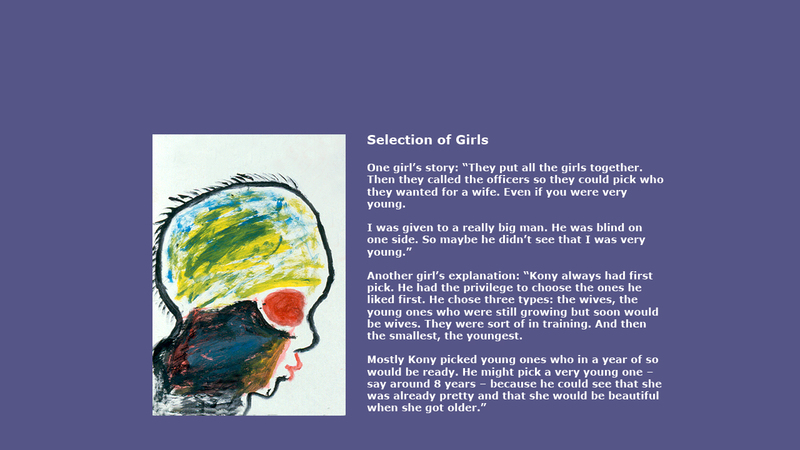 Girls had the added horror of being given as forced wives to the LRA commanders. 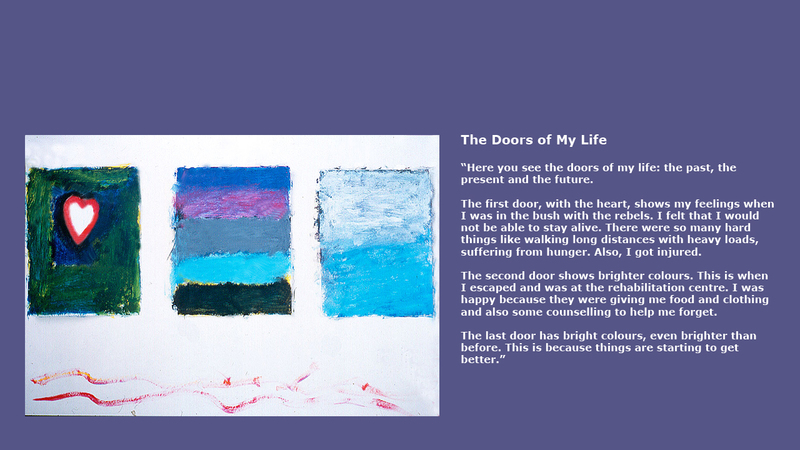 The pictures and stories in this gallery were made by those who were lucky enough to escape. The war in Northern Uganda began in 1986 and ended around 2007. 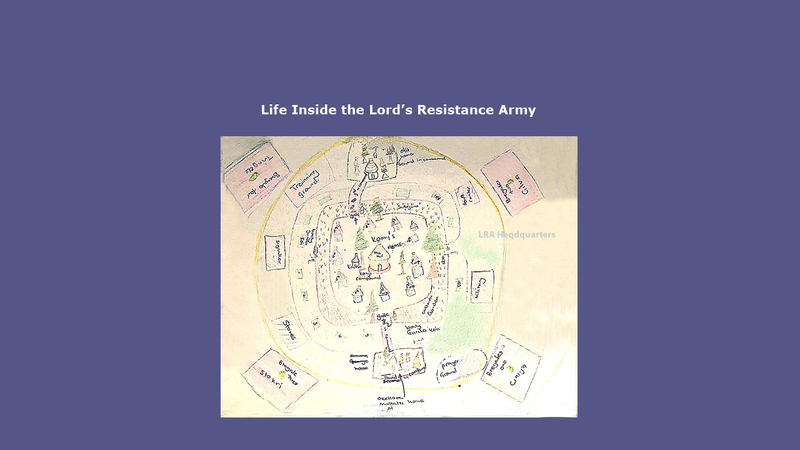 This was a civil war between the government of Uganda and the Lord’s Resistance Army (LRA). The LRA, under the command of Joseph Kony, was committed to the overthrow of the Ugandan government and its president, Yoweri Museveni. The LRA’s strategy was to create chaos in the Northern Uganda region through a series of atrocities against the local population. 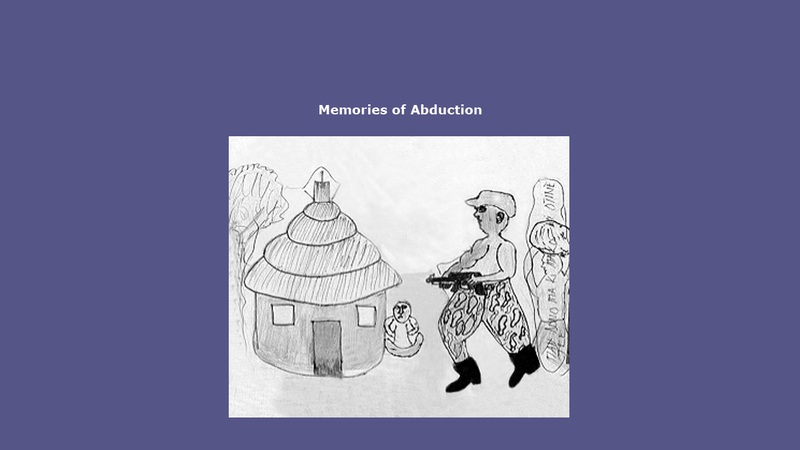 These actions included the abduction of children and their forced recruitment into the LRA ranks. Until the early 2000s the LRA maintained its headquarters in South Sudan, receiving assistance from the Sudanese government who were, at that time, in a war against the Dinka people in South Sudan. This provided them with a measure of safety against attacks from the Uganda Army. In the early 2000s this stopped as the government of Sudan withdrew its support for the LRA and also allowed the Ugandan government to bomb the LRA headquarters. Finally, in 2006 – 2007, peace talks were initiated between the Ugandan government and the LRA leadership. Though initially there was hope for an agreement, the talks broke down and the LRA leadership fled to the eastern Congo. 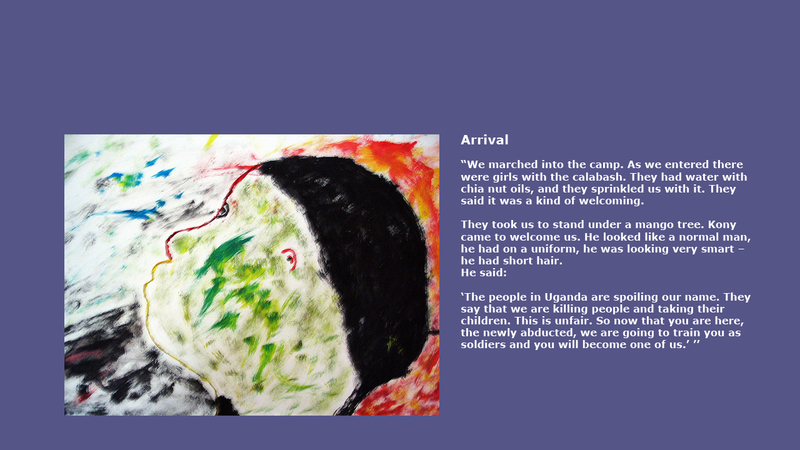 Many children were able to escape the LRA during this time. 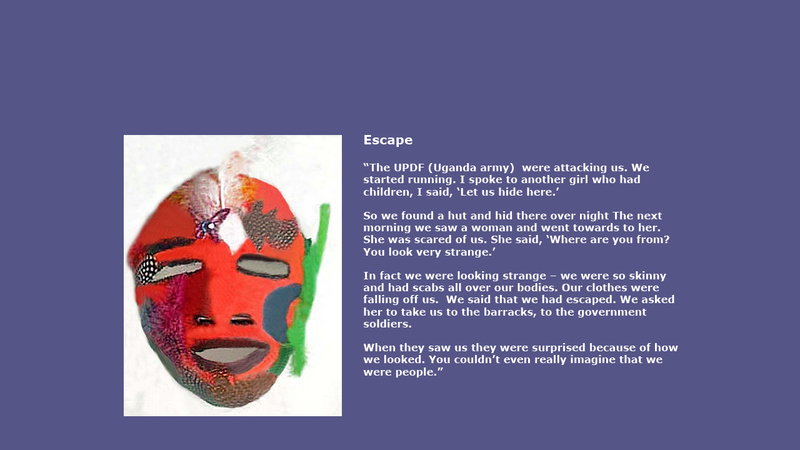 At this point the majority of those who survived their time with the LRA have been able to return to Northern Uganda, though there are still some young people under Kony’s control. The displaced people’s camps have been closed and the Acholi people are in a slow process of recovery and transition to peace. Joseph Kony continues to operate in the east African region and has been able to elude numerous attempts to capture him. 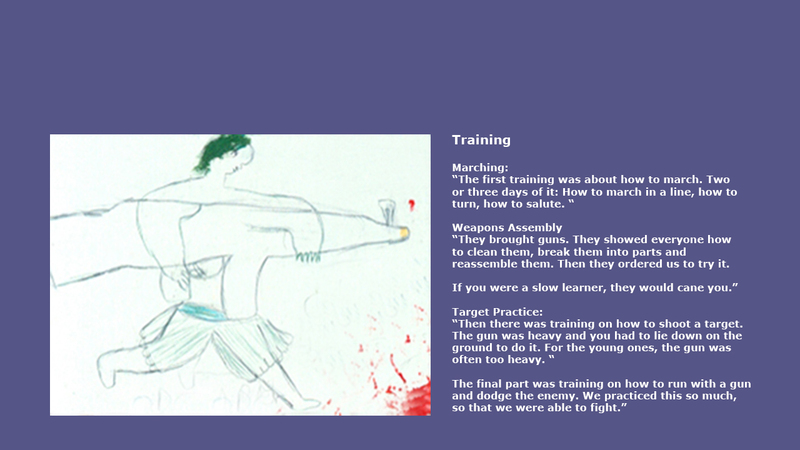 The artwork and stories in this presentation were produced in workshops conducted by Children/Youth as Peacebuilders (CAP) in cooperation with the World Vision Rehabilitation Centre. 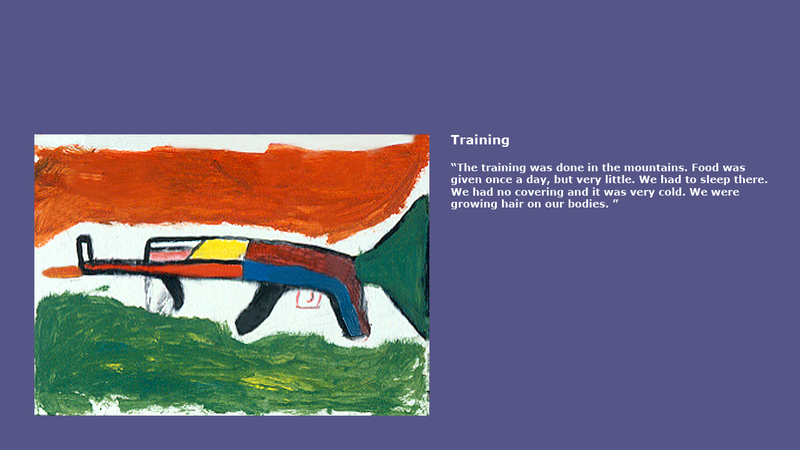 These workshops were conducted at various times from 1997 – 2013. 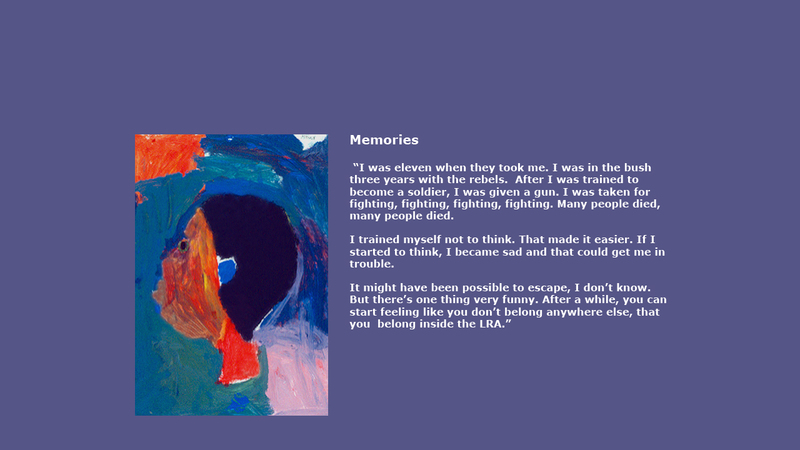 The art activities were designed to help returnees (child soldiers who had escaped from the LRA) tell their stories and come to terms with a difficult past. 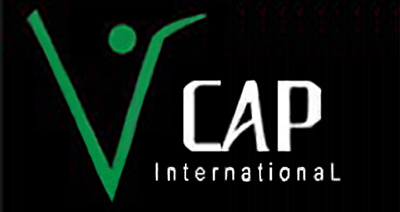 All the activities were developed in cooperation with the centre counsellors. 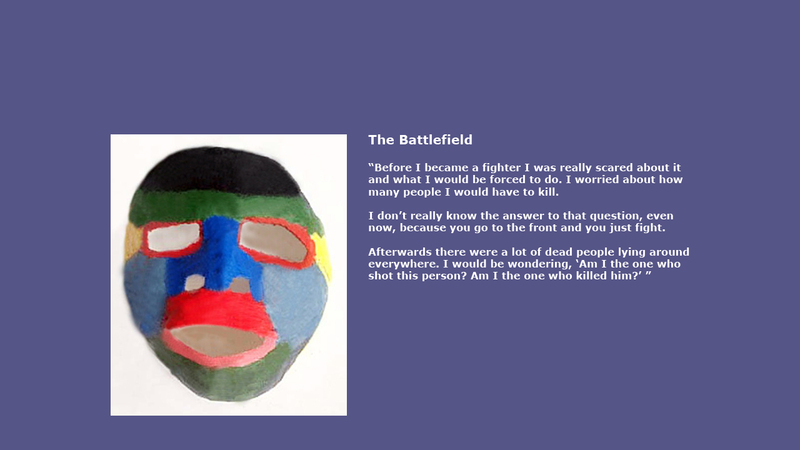 This included mask making, mapping, story drawings and self portraits. 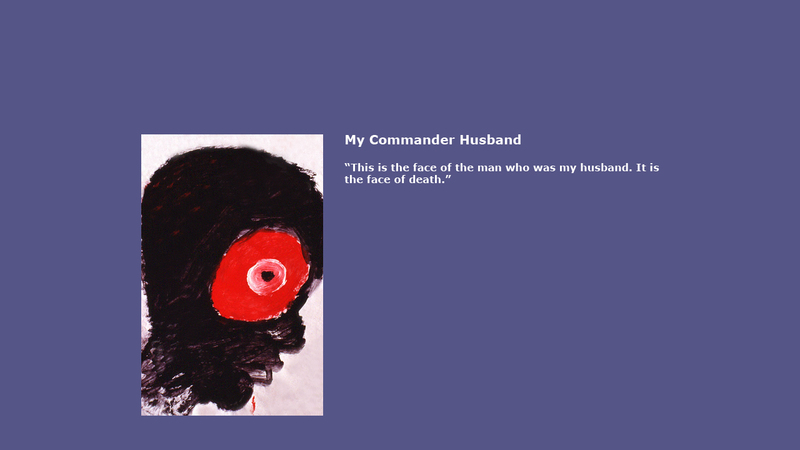 The girls particularly enjoyed making caricatures of their commander husbands. 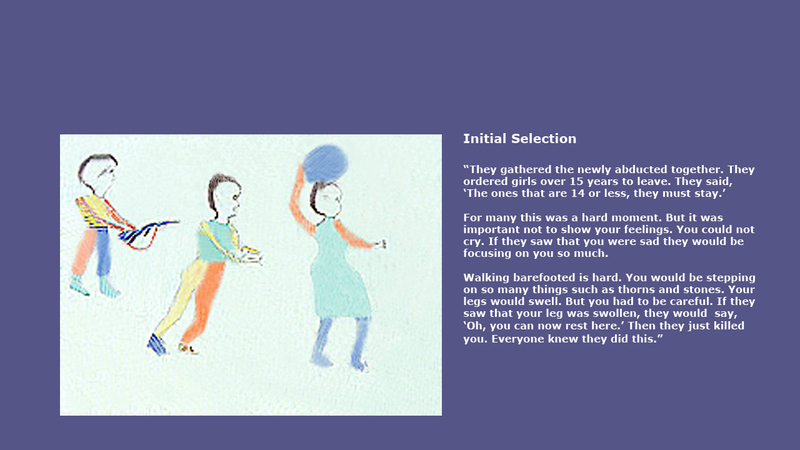 They would laugh and describe these “fat old men” who would strut around the LRA headquarters. Privacy and security are, of course, major concerns for all returnees. 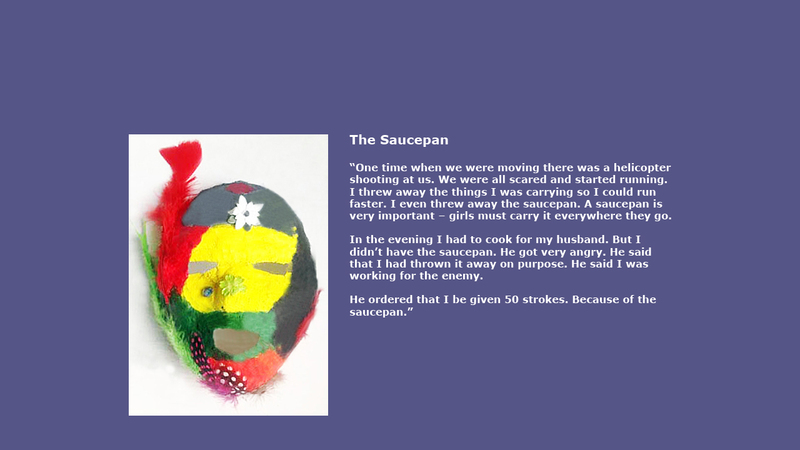 At the same time they are eager for others to know their stories and so readily agreed that materials they produced could be used for education purposes. 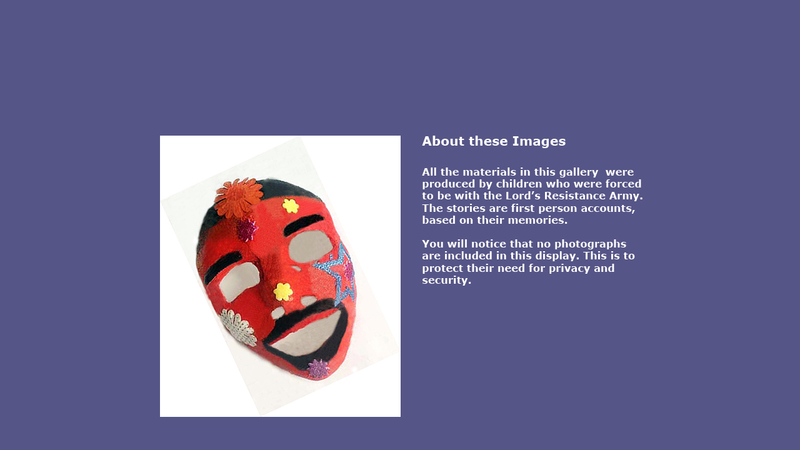 The images in this gallery have been shown in many art galleries, including the Nobel Peace Centre and Canada’s Museum of Human Rights.